I am very proud that an interactive sculpture I made, in collaboration with IBM’s CTO for UK and N.Ireland, Andy Stanford Clark, has gone on display in the Head Office of IBM, Southbank, London. Not the usual audience for my work but one I am very happy about. The work had been commissioned and exhibited in a contemporary art gallery, Quay Arts on the Isle of Wight before it was installed at IBM on Wednesday. Quay Arts in conjunction with Arts Council England ran a series called Hidden Heroes on the Isle of Wight and Andy was one of the Islands heroes they decided to represent. The work not only shows a little of the technology that Andy’s has invented (he has invented a lot!) but also reflects themes within my work. Much of my work involves the public, whereby I encourage the viewer to participate and interact with the work. There is a sense of community and connectedness about it. Ferry Lights shows the position of the ferries as they traverse the Solent in real-time, mapping out their location with LEDs, as they make their journeys between the mainland and the Isle of Wight where Andy Stanford-Clark lives. To extend the theme of connectedness and community, we decided that the LEDs around the circumference of the sculpture were to be connected to Cheerlights, an Internet of Things project created by Hans Scharler, By tweeting “#cheerlights red (or whatever colour you like) your tweet changes the colour of the LED’s thus changing the colour of the sculpture. But as Cheerlights is a connected community, not only does your tweet change the colour of Ferry Lights but it also changes the colour of Cheerlights all over the world. There is something very exciting, empowering perhaps about standing in front of a sculpture and not just being able to change its state with one written instruction but knowing that hundreds of other lights in the world have changed state too, thus connecting physical things with a shared social networking experience. I must say I am also enjoying the fact that people outside the gallery setting, and/or the corporate environment, have some say over what colour the sculpture on the wall is going to be. At IBM’s Head Office today someone outside of the corporate setting is going to decide on what colour the sculpture on the wall outside the Franklin meeting room is going to be. There is something joyful about being able to change the colours on the wall and affect the environment in a space you are not physically in and ‘interacting’ with people you have never met –perhaps someone’s day might be slightly nicer if the sculpture switched to blue, - their favourite colour. I really enjoyed going to see Age of Terror: Art Since 9/11, the highlight being The Twin Towers (2011) by Chilean artist Iván Navarro’s. It has never been shown in the UK before and is truly stunning if you only go to see that one piece it would be worth the entry free and time spent in the museum. 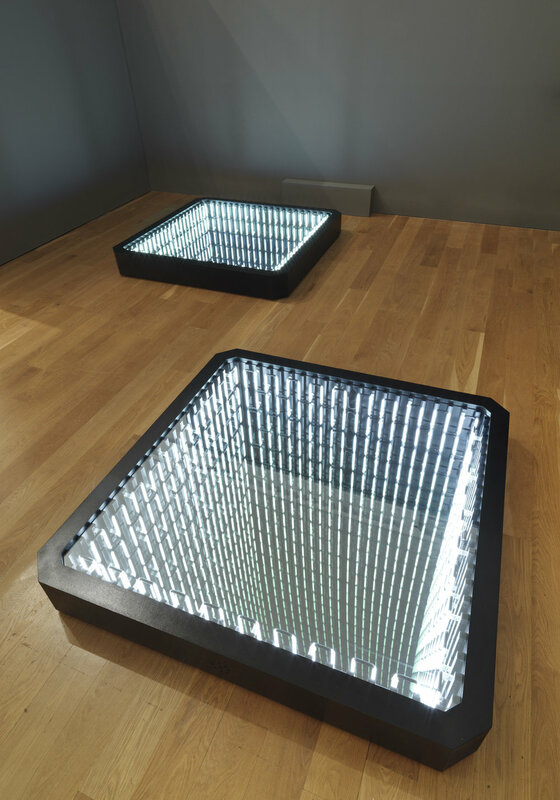 I have seen infinity mirrors before, I have even made one, (ok two) in fact I made one very recently called Ferry Lights, a commission for Quay Arts celebrating the technology of Andy Stanford-Clarke. I wonder sometimes about art works that incorporate lights, as many of my pieces do, I joked this week when some one came up to me and told me that Territory had been getting a lot of attention from people walking down the corridor, that is the Linear Gallery, at UCA. My reply was "of course it gets a lot of attention, it lights up". Perhaps a little self-deprecating I know. I actually think the piece Territory is great, in fact, I would go as far to say that it has sparked a lot of ideas in me and others. It was make very quickly and I was under pressure at the time and so for me that was a great way of working, as much of my work is very laboured and thought out beforehand, all the working out going on in my head before I even think about picking up some material. Document, document, document the the creative process but it happens so quikcly in my head that I am five iterations on before I remember to write something down at least. Even if the art is bad, not too well thought out, terrible in fact - light anything up and for some reason it becomes passable. People may not like it but they won't hate it. We have crits next week on the pieces set up in the Linea Gallery at UCA. Looks like mine got critiqued ahead of time. 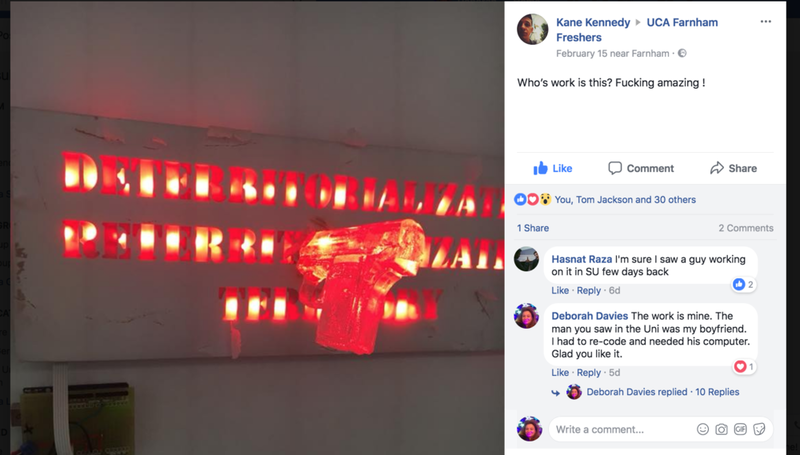 It appeared to have attracted some attention online when a student walking past took a photo of it and posted on UCA Farnham Freshers like of my piece. He now wants to buy it. He said I was a "3D Banksy". The opening of Quay Arts Hidden Heroes opened yesterday. I am just too tired to write anything, but want to show some pictures. Logo of Cut Laser Cut the sponsors of Ferry Lights. Great thanks goes to Cut Laser Cut who sponsored the acrylic cutting and some of the material costs to make Ferry Light a great success. The leaflet pile next to #DicktatorDon you see in the photograph shows how to apply for one which is my art practice, that of collaboration, co-creation and interconnectedness. I was asked to supply a limited edition of #DicktatorDon, my interactive felt, fabric effigy of Trump. The offer came from Sarah Staton and her super cool, SupaStore The premise of #DicktatorDon is that he is not for sale, or at least had not been up to the point at which Sarah approached me. I loved the idea of him being in SupaStore , which artist wouldn't? However, I also wanted to inform people of my art project and continue with it. Sarah Staton was kind enough to hear about my art practice as I explained that #DicktatorDon was not something that I had intended to sell. It was her suggestion that I send the gallery a leaflet that they could print off in the USA, explaining my project, I bore in mind that the USA have different paper sizes and so made the design files in accordance to their requirements. I didn't get confirmation back that they had been able to print the leaflets out but when I next looked on the gallery's blog they had posted a picture of #DicktatorDon with the leaflets sitting next to him. I am Supa grateful to the Supa Sarah and her SupaStore. For more information about he show look here. 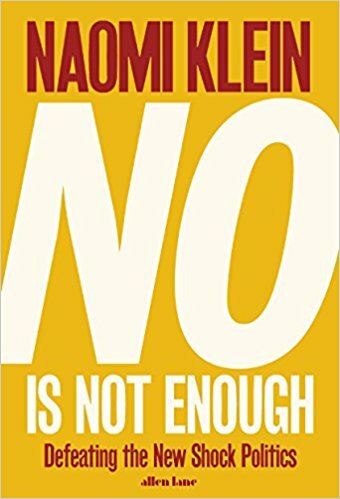 I am reading Naomi Klein's latest book: No is Not Enough. The Guardian review is worth taking a look at. I am often asked why I make art that has an American focus when there are so many issues in the UK I could look at. There is both a general answer to this and a more personal one. I am not willing to go into the personal right now but if you want to know why American politics affects the rest of the world then reading this book is a great read. Many of the issues facing the USA are faced by us in the UK and with Brexit the UK’s ties to the USA could be even greater if we are to pursue trade deals with them. The UK is linked to the USA in so many ways and that is why it holds such a fascination for me. Trump’s visit to the UK has been put on hold and the Women’s march linked us further secured the notion that their fight is our fight too. The work is progressing to make an interactive sculpture as part of Hidden Heroes on the Isle of Wight, an exhibition showing the hidden heroes on the Isle of Wight. I have been giving a lot of consideration to what it is I am going to make and why. To know about the work Andy is famous for is shaping how this project is developing. On the island he is most renowned for his real-time mapping of the ferries as they cross the Solent. By intercepting the signal they give out (perfectly legal to do this by the way) and then mapping it geographically on a screen people see where the ferries are at any given time. He is also interested in connected communities. The aim of the sculpture is to replecate his ferry tracking in some kind of 3-D structure. and I so I am playing around with the use of infinity mirrors at the moment. The look and feel of them with the reflective nature of the mirror will reflect the notion of water. The depth offered by the infinity mirror offers is also a comment on how technology has no end - that no one knows where it might end. The photos show the prototype that I have made. I am trying to see if I can place leds behind cutouts in acrylic to show the progression of ferries as they travel across the Solent. Of course it is a colloboration and so I will not be doing the technical aspect of the sculpture, that is the job of Andy. The lights you see around the edge will be connected to CheerLights a way of connecting people across the world through IOT. The distinction within this group of artists is apparent. With their varying subject matter and methodologies, this show makes for an exciting exhibition, rich with ideas and concepts. The exhibition incorporates a diversity of multidisciplinary artwork. An array of mediums is combined, including photography, sculpture and installation. Artist in the show include. I am pleased to announce that I have been commissioned to make a piece of art for Quay Arts, a contemporary art gallery on the Isle of Wight as part of the “Isle of Wight Hidden Heroes” project. The brief is to express Andy Stanford-Clarke’s status as being on the cutting edge of technology. One of Stanford-Clarke’s many contributions in his field is his real-time mapping of the ferries crossing the Solent. He is also a great advocate of the worldwide phenomenon, CheerLights so the piece will most probably incorporate both these elements. CheerLights is an “Internet of Things” project created by Hans Scharler that allows people’s lights all across the world to synchronize to one colour set by Twitter. It is a way to connect physical things to a social networking experiences. For example, by sending the following tweet from a twitter account “@CheerLights, red” the tweet will cause a chain reaction and all of the lights across the world that have signed upto CheerLights will turn that colour. Until the next time some send a tweet to CheerLights requesting a different colour that is and then all the lights will change again. It was a lesson in just being brave and handing him out to people, so when artist Simon Bill came to UCA Farnham to talk to the MA and BA students about his work I was fortunate enough to have a tutorial with him where I gave him a #DicktatorDon. 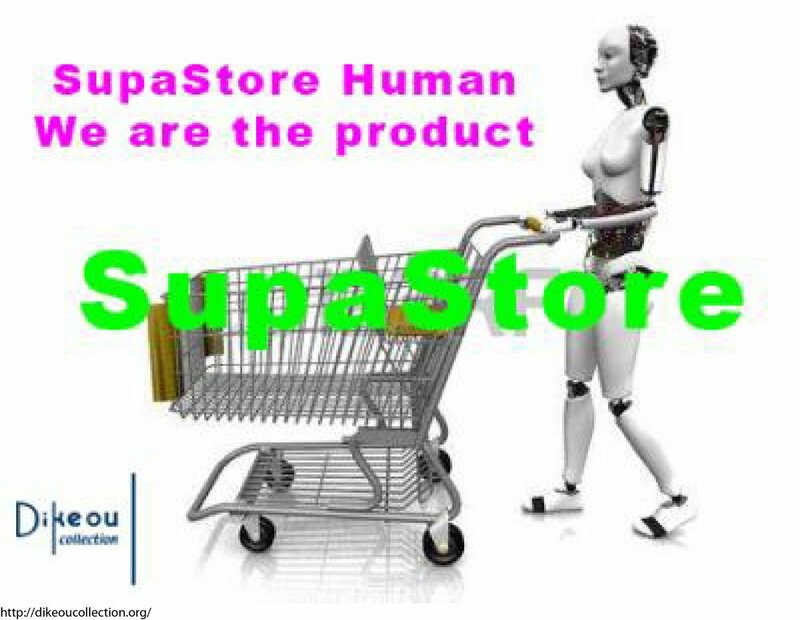 The next day I received an email from Sarah Staton, a senior lecturer at the Royal College of Art who was looking for work to go into her SupaStore- Human We Are the Product, a pop-up gallery in Denver, Colorado, USA. Simon Bill had shown her #DicktatorDon and she thought it would be a good fit for so she contacted me via email to see if I would be willing to send the gallery three #DicktatorDon’s for inclusion into her latest Supastore. Private view photos - "Bad News"
It was a great night, A huge thank you to Newspeak House for allowing us to have their amazing space as a venue and thank you to Eva Pascoe, at Cybersalon not only did they host a great speaker event afterwards which brought in a huge crowd for us, but they also paid for all the wine which was a super lovely and much appreciated gesture. Nearest station: Shoreditch High Street. LONDON, UK: The fictitious ‘Office for Global Improvement’ shouts messages in an attempt to micro-manage you. A small interactive effigy of the ‘orange one’ sits on a shelf with a set a pins with which to stab him, whilst another sculpture, taking its feed from Twitter comments on the suspected Russian interference in the US presidential elections. This art exhibition is certainly Bad News. In this pop-up art exhibition, Artists Dd (Deborah Davies) and Hilary Champion explore, with more than a spattering of humour, various themes relating to power, politics, representation and conversation. 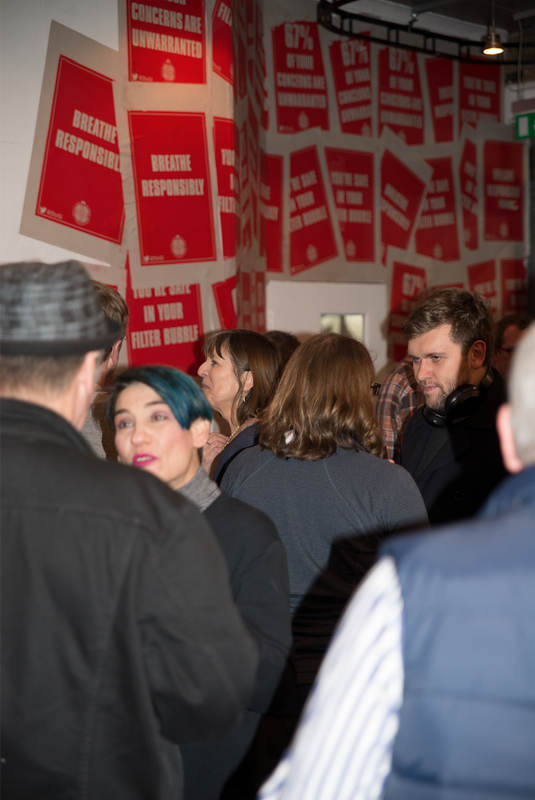 Exhibiting at Newspeak House, in Shoreditch, London, UK, home for a community of political technologists, it is the ideal venue for the exhibition that runs from 7th – 20th December 2017. Messages From The Office For Global Improvement. This work critiques the bombardment of the public by a constant stream of over-zealous advice, warnings and veiled attempts to micro-manage many aspects of people’s lives. Dd’s Faded Glory represents the ebb and flow of conversations on Twitter around Russia’s suspected interference in the USA Elections of November 2016 and the subsequent fallout, such as the congressional hearings and the Mueller investigation. Taking its feed from the live Twitter API the conversations are simplified to a positive or negative statement about Russia’s alleged interference. The more negative the conversations, the stronger the Russian flag shines through the Stars and Stripes until it eclipses Old Glory completely. Combining textiles using a devoré technique to distress the fabric the work is combined with LED’s and electronics and a twitter feed. This hand-made effigy of the ‘orange one’ is designed to be humorous in that you can literally poke fun at the 45th President of the United States of America. It invites participants to work out for themselves where they should prick him if they want to make his eyes light up. Throughout the last six months Dd has been sending a limited number of #DicktatorDons to those who apply for one online through the website. Some results of their interactions with #DicktatorDon will be on display in the exhibition. You can even apply to own your own and be part of this interactive and particular art work when visiting the gallery. This work is another example of how Dd’s art practice explores representation, empowerment, conversation and feedback.. In Messages From The Office For Global Improvement, Hilary Champion demonstrates her strong empathy with Noam Chomsky who believed that governments increasingly keep their populaces preoccupied with small questions so that they will not think to ask the big questions. In particular she critiques the bombardment of the public by a constant stream of over-zealous advice, warnings and veiled attempts to micro-manage many aspects of people’s lives. The warnings, enthusiastically disseminated by both conventional and social media, cover a plethora of topics. This includes the health risks posed by over-cooked chips, arsenic in rice and the threat to air quality posed by the methane produced by cattle. Working under the guise of the totally fictitious ‘Office For Global Improvement’ she produces hand-made screen-prints to satirize this relentless stream of pronouncements from armies of faceless bureaucrats. Gallery visitors will be encouraged to add their own experiences of spurious advice to those amassed from her previous showings of this work. Dd is an international exhibiting artist. She works in a variety of mediums from sculpture to installations, from soft-circuits to video and textiles. Many of her pieces are responsive, reacting and changing in response to participants’ engagement. She leans towards working with light. In the early 90’s, Dd studied for a BA Hons in Photography at West Surrey College of Art and Design, UK. More significantly in her graduation year, her work was selected for the highly prestigious John Kobal Photographic Portrait Award. After graduating she had a successful career as a TV Producer/Director/Broadcast Journalist for a variety of broadcasters including the BBC. Having built up a body of artistic work, she left television when offered the position of Artist in Residence at the University of London’s Centre for Creative Collaboration (C4CC) in the UK, in 2010. During her time at C4CC, she became interested in wearable technology. Her views on this subject appear in the book “Designing with Smart Textiles” (London: Bloomsbury/Fairchild written by Sarah Kettley released, early 2016). Dd’s work has been included in London Design Festival, BetaHaus, KunstHaus Kule and KunstHalle Platoon in Berlin, Germany. She has also exhibited large scale sculptures at Burning Man in 2013, 2014 and 2016 with StarWay and interactive sculpture. From 2016 – 2017 StarWay was installed in Playa Park, a public sculpture park in Reno, Nevada. #DicktatorDon is to be included in Sarah Staton’s SupaStore Human- We are the product at The Dikeou Collection, Denver, Colorada, USA in December in 2017. Hilary Champion has always been interested in using her practice to critique what she feels are major issues. Reflecting her South Wales heritage, she began her career by devising sculptures and installations highlighting the involvement of Welsh plantation owners in the slave trade and sugar industry. Subsequently her work was a manifestation of her dream that one day all conflict and violence would have ended. In her latest practice she uses her experience of working in the advertising, PR and press industries and her interest in writers such as George Orwell , Noam Chomsky and Dr Ben Goldacre to critique fake news and the manipulation of the media by those with secret, vested interests. Her work was recently shown as part of Statement in Bloomsbury, The Waiting Room in Wandsworth Common Mainline Station ( where she exhibited a customized No Waiting Sign) and an exhibition at Brighton's Jubilee Library. Private view: 7th December, 6pm to 8pm please email: contact@dddavies if you would like to come. When other skills are needed. The process of making is very important to me but even I recognize I need to collaborate with others and I often do. The fictitious ‘Office for Global Improvement’ shouts messages in an attempt to micro-manage you. 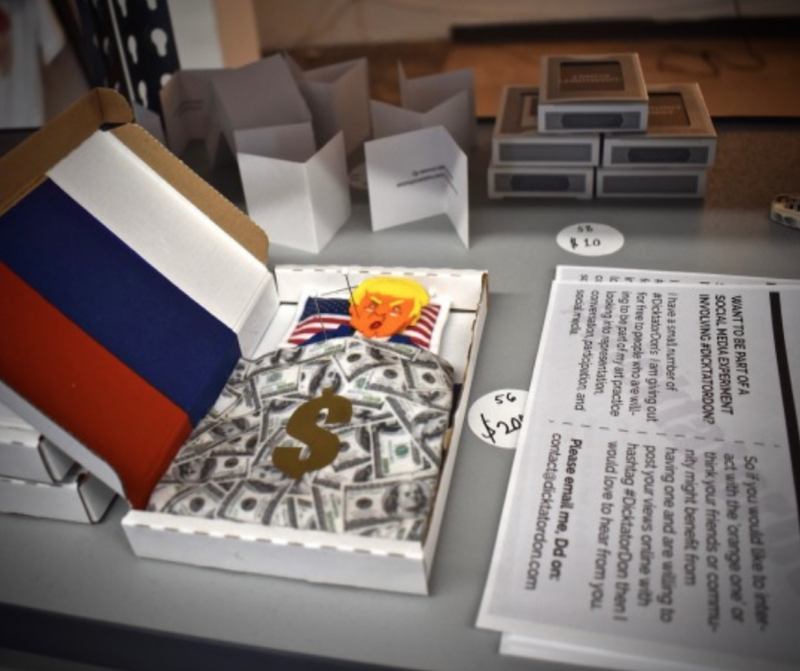 A small interactive effigy of the ‘orange one’ sits on a shelf with a set a pins with which to stab him, whilst another sculpture, taking its feed from Twitter, comments on the suspected Russian interference in the US presidential elections. 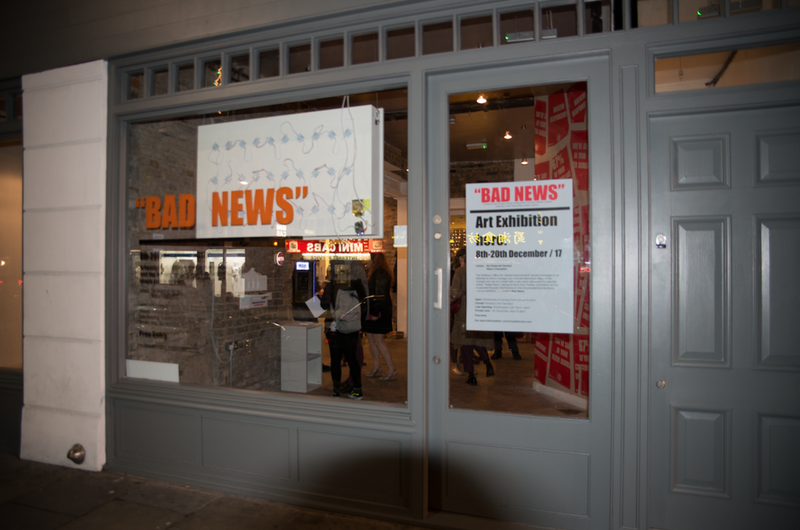 This art exhibition is certainly Bad News. The fictitious ‘Office for Global Improvement’ shouts messages in an attempt to micro-manage you. A small interactive effigy of the ‘orange one’ sits on a shelf with a set a pins with which to stab him, whilst ‘Faded Glory’ takes a feed from comments posted to twitter on the suspected Russian interference in the US presidential elections. 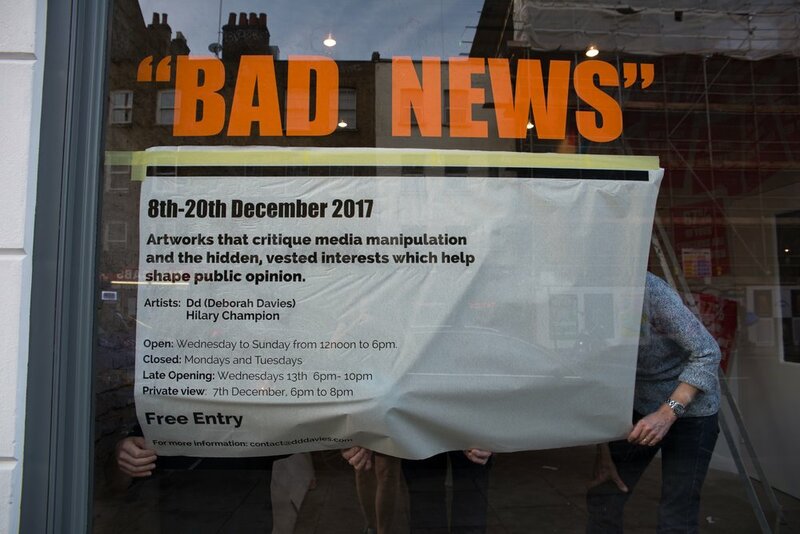 Cybersalon will be hosting their event at Newspeak House on the opening night of "Bad News" an exhibition looking at media manipulation. Cybersalon is a think tank on digital futures, we’ve been running monthly events on digital arts and culture since 1997. Our events attract a wide range of people, entrepreneurs, technologists, hackers, activists, government officials, business leaders, academics, artists, creatives and designers. Cybersalon members produce research and insights on a range of topics, from big data, quantified self to cyborgs, focusing on the digital revolution. At the Lisson Gallery, London, the man behind me waits; he must think it’s 2002 again. In that year Sierra denied people access to the gallery by blocking its entrance on the opening night with a wall of corrugated steel. Newspeak House: What better place to exhibit the artwork Interference, a data visualization piece surrounding the ongoing investigation into the Russian hack. Cited in an article by the Guardian, Newspeak House is home to "‘political technologists’ who are trying to fix broken parts of our electoral system".